A final vote is expected today on a so-called Right-to-work bill that would bar mandatory union fees. The Missouri Senate voted Wednesday 21-12, largely along party lines, in favor of the measure. 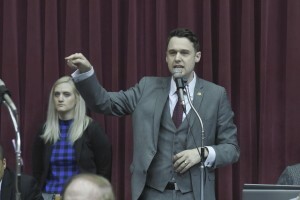 Three Republicans sided with Democrats and voted against the measure – Senators Paul Wieland of Imperial, Gary Romine of Farmington and Ryan Silvey of Kansas City. Sen. John Rizzo (D-Kansas City) says a Right-to-work law would benefit millionaires and billionaires. “When you look at dollars and cents, I was told in politics years ago, when it’s not about the money, it’s about the money. I think we all know obviously what it’s about. It’s about lower wages,” says Rizzo. Sen. Gina Walsh (D-Bellefontaine Neighbors) says the proposal would undermine the middle class. “We need to protect the workers. We need to keep it at a living wage because when you have a union involved, even the non-union sector benefits from that,” says Walsh. Supporters of the proposal say a Right-to-work law would improve Missouri’s economy and create more jobs. Governor Greitens supports the measure. If approved by Senators, the legislation would go back to the House with changes. The Senate version includes a provision that would exempt current union contracts until they expire or are opened up.